Thank you Rosie for having the integrity to stand up for what you believe in. Blueglow on Wed, 04/25/2007 - 6:14pm. Jon Gold on Wed, 04/25/2007 - 6:15pm. You are one of the rare people who I admire for your tenacity and your quest for thruth. Please, never let anyone take that from you. Curiously on Wed, 04/25/2007 - 6:26pm. For your bravery, your wit, and your devotion to what's good about this country. Jon Gold on Wed, 04/25/2007 - 6:32pm. That Rosie has received the emails I've been sending her in John's name. This is so friggin' awesome you guys have no idea... I am so friggin' happy for the FealGoodFoundation, and for first responders in general. Jon Gold on Wed, 04/25/2007 - 7:58pm. Jules on Wed, 04/25/2007 - 8:09pm. Jon Gold on Wed, 04/25/2007 - 8:12pm. I am humbled again by the kindness and warmth of the American soul. When one woman can make a difference and an impact for a special cause, then I give a thousand thanks to all Americans who still care about yesterday's heroes. We will continue to serve the 9/11 responders with the utmost dignity and respect. 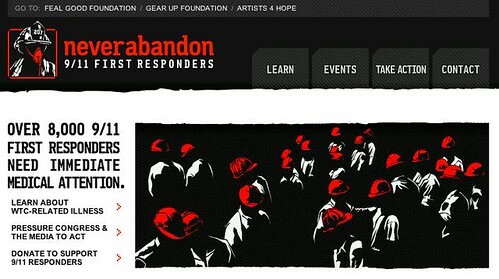 I thank Jon Gold/Rosie/and everyone who supports us, while we help 9/11 responders. Jon Gold on Wed, 04/25/2007 - 8:23pm. Trying to help out. Have a look. Spread the word. Jules on Wed, 04/25/2007 - 8:29pm. executive producer (Zionist? Bilderberger?) Babba Wawa & the rest of the corporate tv media could not tolerate her 9/11 truthing for another minute. Rosie has amazing courage, IMO! Colombo on Wed, 04/25/2007 - 10:35pm. May it become a reality. It would do well, and she'd be able to cover whatever she wants..! It could happen. Everything is starting to change. The corruption can only begin to fall away in the light of the truth, and the reality. The entire climate is starting to change now, and with the release of Loose Change, Final Cut, it will begin to rain down truth, everywhere..
Robert Rice on Wed, 04/25/2007 - 10:45pm. Thank GOD they are still airing this! I was worried when I watched yesterday and they said Alec Baldwin would be on Friday---I thought that would be the whole show---guess not. I really have high hopes for what Rosie decides to do with her new found freedom. She can be a great force in shedding light on what is going on in and to this country by spreading the horrible truths to a loyal audience. Tonya on Thu, 04/26/2007 - 11:22am.